The NNNO Board of Directors has recently heard from many nurses and interested stake holders who are just learning about the Office of the National Nurse Initiative. We encourage everyone to read the article, Nurses and The Public Say It's Time for Change that was published in Medscape Nurses last July. There is also a Frequently Asked Question link on our Home Page. The National Nursing Network Organization (NNNO) recognizes the current window of opportunity to strengthen the delivery of prevention education and highlight the nurse's role in our healthcare system. We are excited to hear leaders of the Public Health and Prevention subgroups for healthcare reform share this vision. 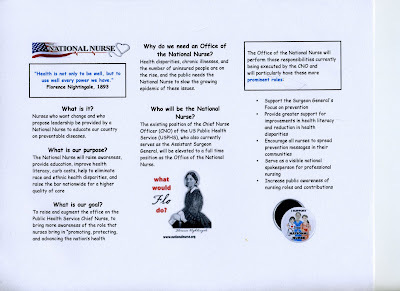 The NNNO proposal for an Office of the National Nurse brings nurses to the forefront as the deliverers of the message of prevention to every American. The ONN initiative is focused on strengthening the work of existing groups such as the Office of the Surgeon General, the American Public Health Association, Medical Reserve Corps and community agencies through a more robust and modernized nursing leadership presence. Nurses are well positioned to provide this much needed change as they are 2.9 million strong, the most trusted of all health professionals, span all cultures, and are accomplished health educators. 1. The Office, led by the National Nurse, is a federal position within an established health care agency. We are recommending that the Chief Nurse Officer of the USPHS head the Office of the National Nurse, as this is a position that currently exists and is funded, but needs to be modernized with job responsibilities shifted to primarily focus on the national and local delivery of wellness, health promotion, and illness prevention education to all Americans. 2. Enhanced community systems utilizing nurses and other healthcare providers as volunteer educators. Volunteers mobilized under the guidance of the USPHS through existing systems such as the Medical Reserve Corps would focus on delivering health promotion information in their communities. Education activities would focus on strengthening current successful practices with the goal of improving health outcomes by teaching and promoting healthier living. These efforts would also seek to reduce health disparities, which is consistent with the Surgeon General's priorities and Healthy People 2020 goals. The original legislation to establish the National Nurse that was introduced by Rep. Lois Capps (CA-23) in the 109th Congress amassed the bi-partisan support of 42 co-sponsors. The complete list of endorsers with a link to HR 4903, the National Nurse Act of 2006, can be found at http://nationalnurse.blogspot.com. Revised future legislation will ask that Congress elevate the CNO position to full time and bestow the title National Nurse to provide the necessary visibility, prominence and legitimate power to focus the country's attention on prevention. • Establish national leadership for prevention by elevating and strengthening the Chief Nurse Officer of the USPHS to make this existing position more visible to the nursing profession and the public. • Enhance the collaborative relationship with the U.S. Surgeon General's office. • Promote nurse involvement in the Medical Reserve Corps to improve the public health and safety of the community. • Strengthen the use of evidence-based successful prevention strategies at the community level. • Become a prominent recognized national symbol of professional nursing to enhance recruitment and support policies that strengthen nursing education and practice. As the National Nursing Network Organization board members continue to connect with different nursing organizations and stakeholders, they receive positive feedback from those who are just now learning about this grassroots nursing effort to promote prevention in healthcare. Many state and national organizations have already endorsed this proposal and it has been written about in numerous publications and presented at several state and national conferences/conventions. Visit http://nationalnurse.org/endorsements.shtml for endorsing organizations. Resolutions urging Congress to enact legislation for an Office of the National Nurse have unanimously passed in the New York State Assembly and the Massachusetts, Oregon, and Vermont State Legislatures. The NNNO Board of Directors has heard from dozens of nurses and nursing students who have asked for materials that they can use to educate others about the ONN initiative. Thanks to graduating nursing students Christopher Deal, Lisseth Ortega, and Coral Sohn for designing the pictured tri-fold pamphlet about the Office of the National Nurse initiative. Click on each side to enlarge and read it. Please email teri@nationalnurse.info and we will email this to you in a word document that you can reproduce and distribute to others. The Board of Directors of the National Nursing Network Organization received the following letter that was written urging Congresswoman Carolyn McCarthy (NY-04) to introduce legislation to establish an Office of the National Nurse in the 111th Congress. This communication was initiated by Molloy College graduate nursing student Roberta Schieda BSN, RN and has been signed by over 80 graduate nursing students and distinguished nursing faculty. Ms. Schieda and many of those signing the letter below are constituents of Congresswoman McCarthy. We commend your strong advocacy for the nursing profession and health care reform. We are writing today to urge you to reintroduce legislation to establish an Office of the National Nurse for prevention in the first session of the 111th Congress. As nurses, healthcare workers, and consumers who live in your Congressional District, we are all too aware that our healthcare system is in a time of crisis and requires fixing. Most of the public is expressing their support for prevention to be a part of the solution and we believe it is time for the nursing profession to have representation at the nation's healthcare table especially since health promotion is such an important component of every nurse's daily practice. Prevention is known to be the best way to contain health care costs, improve the overall health of individuals and build stronger communities. • Assist in the initiation of a nationwide cultural shift to prevention. • Bolster efforts to focus the public on healthy living. • Publicize and intensify roles for nurses, including students and retirees, in community health promotion. • Provide greater support tot he Surgeon General in calling for improvements in health literacy and reduction in health disparities. • Encourage all nurses to spread prevention messages in their communities. • Encourage participation of nurses in Medical Reserve Corps units. • Provide leadership to network with existing volunteer health promotion efforts. • Strengthen linkages with providers, nursing programs, and public health leadership. • Serve as a visible national spokesperson for professional nursing. • Increase public awareness of nursing roles and contributions. • Enhance nursing recruitment and education throughout all communities. • Support and justify additional funding for nursing education, research and service. 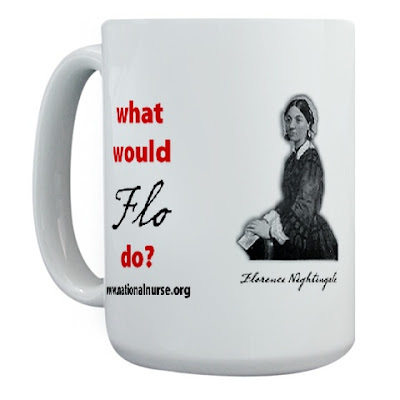 We believe creating an Office of the National Nurse would set a new standard for a more accurate positive portrayal of nursing's importance to health and healthcare in the United States. Nurses are on the forefront in hospitals, schools, and in the community. We are compassionate, well-educated, empathetic individuals with a strong desire to educate and treat the public. If our government enthusiastically and publicly embraced nursing, making its crucial contributions clearly evident, perhaps the public and media would have a greater understanding of and appreciation for the unlimited ways nursing positively impacts the health of our nation. Nurses outnumber physicians three to one and therefore represent the nation's largest workforce in healthcare. Nurses provide an immeasurable service to the community and nation in whole. Findings from nursing research have had significant impact on improving the health oft he nation. We serve as advocates for those in need and are highly trusted by the public. The Office of the National Nurse could provide a strong, stabilizing voice that can work to positively influence the healthcare of our nation. As your constituents, we want you to know that we strongly support the establishment of the Office of the National Nurse, and we would be honored to have you sponsor this piece of legislation. We will look forward to learning your plans for introduction. National Nurses Week Theme "Nurses Building A Health America" Resonates With Supporters of Office of the National Nurse! Press coverage and public interest in the Office of the National Nurse initiative continues to build and this was indeed the case during National Nurses Week. Thank you to Kathy Quan RN, BSN, PHN for writing "We Need A National Nurse Now" and posting it on many of her websites. The article definitely resonated with readers and many left excellent comments in support. Keith RN left this statement, "Yes, we need a National Nurse, and we need the position now more than ever. Nurses are the front line in health care, and we deserve and need recognition and representation at the highest levels. Nurses' education and approach to problem-solving is uniquely different than that of physicians, and a National Nurse who stands on equal footing with the Surgeon General would add a greatly needed voice to the mix. It's time for nurses to rise to their full potential. As the most consistently trusted professionals in America in poll after survey, nurses have so much to offer, and a National Nurse would give nurses the power to reach even more Americans with our message of prevention and wellness." Working Nurse reporter Elizabeth Hanink, RN, BSN, PHN wrote "The Office of the National Nurse" and it is currently the lead story. Hanink states, "Nurses hold a unique position in American healthcare. Over and over, we rank among the most trusted professions. At the same time, we face acute shortages in our numbers. Meanwhile, the United States faces unprecedented pressures: disparities of care, unsustainable costs and epidemics of preventable diseases." As a nurse concerned about the health of our nation, I see the recent events centered on the swine flu as another valid reason to create an Office of the National Nurse. Coupled with the extensive current activities to revise health care and the fact that National Nurses Week's theme (May 6-12) is "Nurses Building a Healthy America," this is the opportune time for legislative action to create an Office of the National Nurse in Washington, D.C. The potential of the nursing work force to improve our nation's health is too great a resource to waste. The nation needs, and all nurses deserve, a prominent "national nurse" leader to partner with the U.S. surgeon general who will offer guidance to coordinate the contributions nurses can make year-round to improve the health of our nation. The movement to create a national nurse is an important initiative with potential for tremendous positive impact in improved health outcomes and cost savings in health care. It also validates the contributions of nursing and provides respect and year-round appreciation for our valuable nursing work force. Van Betten, P. (2009). National nurse. 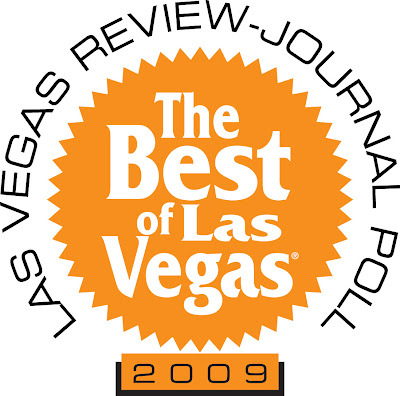 Las Vegas Review-Journal. Retrieved May 9, 2009 from http://www.lvrj.com/opinion/44354297.html. The Board of Directors urges supporters to continue to contact their local media to help spread the word about the Office of the National Nurse initiative. Your efforts are appreciated and will not go unnoticed. National Nurses Week is an excellent opportunity to promote the Office of the National Nurse initiative. Years ago the leaders of our nation declared there be an annual National Nurses observance to celebrate and recognize our nation's nurses. Each year healthcare providers including hospitals, public health departments and schools of nursing plan events during this week to show nurses how they are valued and appreciated, while raising public awareness of the unique contributions nurses make to society 24/7 all year long. This is an important week for nurses, because the focus acknowledges the unique contributions of nurses in every community. It is also an opportune time to raise public awareness of how and why nurses are mobilizing alongside the National Nursing Network Organization to establish an Office of the National Nurse. Nurses deserve to have a year round prominent leader positioned in Washington DC to represent nurses and advocate for the populations we serve. The health of the nation represents tremendous social capital, and will be enhanced and protected with a prominent and visible nurse leading prevention efforts. 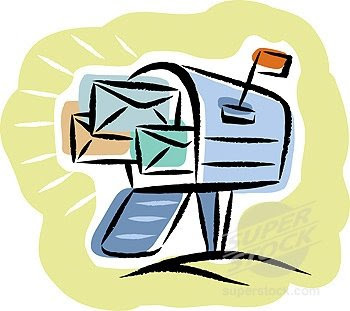 • Write a brief article or letter for your nursing organization's newsletter about the Office of the National Nurse initiative. Here is a brief and current article that was published in the May/June issue of the Nevada State Nurses Association’s newsletter. • Contact your legislative representatives, let them know you favor having a National Nurse. Sample letters and phone scripts are available on the National Nurse website. • Make a small donation to the National Nursing Network Organization either on line or by emailing teri@nationalnurse.info to find out where to send a check. To thank you for your support, we would be delighted to send a certificate of recognition to a respected nursing colleague whom you identify to us to acknowledge their contributions to nursing practice and community and public health. • Plan a family friendly community health fair event, staffed by nurses and nursing students. 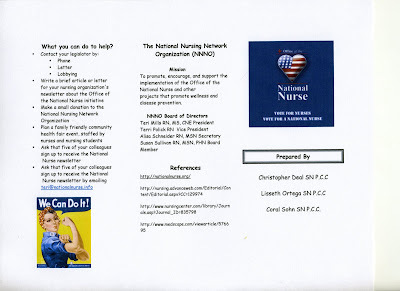 • Make a poster board to display about the Office of the National Nurse initiative. We have many handouts available to assist you. • Request a presentation from an NNNO Board member and we will do our best to meet your needs. • Ask that five of your colleagues sign up to receive the National Nurse newsletter; this is a great way to spread the news about the ONN initiative. • Join the National Nurse Campaign on Facebook. Our Board members are willing to help you with planning. What is most important is that we all "seize the moment" and join the celebration of National Nurses Week! "Health is not only to be well, but to use well every power we have." Cheers for Nurses and Happy Nurses Day! We are celebrating with the launch of our new website, www.RNpathways.com- we invite you to celebrate with us and you could win an iPod Touch or MacBook Pro. What a great week! Thanks to you and all nurses for the dedication you put into nursing. All our thanks would only be a small tribute to nurses that deserve so much more. I hope this finds readers well. I represent HealthcareGoesMobile.com (an online community dedicated to those with an interest in healthcare IT) and I wanted to let you know that we’re celebrating National Nurses Week with a free educational Webinar and gift certificate drawings. The Webinar is open to community members, and those that sign up for the community between May 6-12 are entered to win a $50 gift certificate toward an outlet to purchase scrubs. The Webinar will examine how nurses can improve their daily workflow applications via the latest technological advances. Please let me know if you have questions. Thank you for your time. Best Quick Suggestion For How to Observe National Nurses Week-Send a Letter! The recent concern for a possible “swine flu” pandemic along with the announcement that “Healthcare” is President Obama’s top priority for the next 100 days, and the fact that this year’s National Nurses Week (May 6-12) theme is "Nurses Building a Healthy America" sets up a ‘perfect storm’ of opportunity. Nurses everywhere can take a simple action to make a big difference for the public and our profession. Simply WRITE a letter! 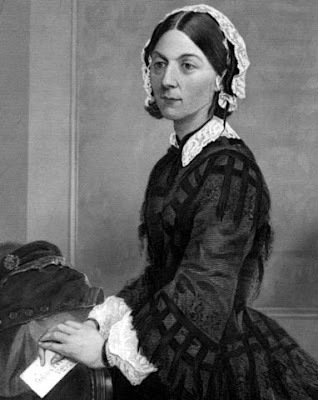 The same strategy that worked for Florence Nightingale so many years ago, facilitated by technology, can be even more effective today especially if the response comes from nurses everywhere. Imagine the impact of thousands of letters from nurses across all specialty areas united and in agreement that the time for a National Nurse is now! Send a quick letter in support of creating a National Nurse to your legislators, to a major national newspaper and/or to your local community newspaper, or to your nursing organization’s newsletter. Email it, or snail mail it, but DO IT! A template is provided below that includes information on how Americans could benefit from an Office of the National Nurse (ONN). Four state legislatures (Massachusetts, New York, Oregon, and Vermont) have already passed resolutions on a grassroots initiative calling for Congress to designate the existing Chief Nurse Officer of the United States Public Health Service (USPHS) to be the country's National Nurse. This popular proposal is simple, pragmatic, and cost-effective. An ONN could unify, inspire and engage nurses to respond in emergencies and to promote prevention. Rather than hearing President Obama or a member of his Cabinet describe the importance of hand washing to the public, a visible and highly respected National Nurse, who is familiar to the public and represents the most trusted health profession, will be much better suited to deliver prevention messages that our nation desperately needs to curb epidemics. These include not only communicable diseases, but also preventable chronic conditions such as obesity, heart disease, and Type 2 diabetes that cost our country trillions of dollars each year. Nurses promote healthy behaviors as a cornerstone of care, no matter what setting they work in. Our nation’s 2.9 million nurses are licensed, knowledgeable health professionals and are present in every community. Many are bicultural and span broad and diverse community populations. What better way to observe National Nurses Week that to take action to honor our country's nurses and support creation of an Office of the National Nurse? For more information visit http://nationalnurse.org. Here is a link to locate your elected US Representative and Senators. Coupled with the extensive current activities to revise healthcare and the fact that National Nurses Week’s (May 6-12) theme is “ Nurses Building a Healthy America,” this is the opportune time for legislative action to create an Office of the National Nurse in Washington DC. The potential of the nursing workforce to improve our nation’s health is too great a resource to waste. The nation needs, and all nurses deserve, a prominent National Nurse leader to partner with the US Surgeon General who will offer guidance to coordinate the contributions nurses can make year round to improve the health of our nation. Supporters of this concept suggest that Congress elevates and expands the role of the Chief Nurse Officer of the USPHS to serve in as National Nurse, as a cost effective move that avoids unnecessary duplication. The movement to create a National Nurse is an important initiative with potential for tremendous positive impact in improved health outcomes and cost savings in healthcare. It also validates the contributions of nursing and provides respect and year round appreciation our valuable nursing workforce. I hope others feel the same and will visit http://nationalnurse.org to become active supporters. Thanks! I sent in letters to The New York Times and The Oregonian. I sent a letter to The Register in Orange County, California. It only takes a minute-usually the email address to submit an OpEd to any newspaper is on their editorial page somewhere. I hope others will use the template and send a letter to your local newspaper. Another supporter sent a letter to the editor of the Las Vegas Review Journal this morning. I just sent a letter to the Editor of the Washington Post. I decided to also submit a letter to the LA Times. Congratulations to Pat Van Betten, whose letter to the editor was published in the Las Vegas Journal Review!